Fifth graders from Aldine ISD watch as a biology graduate student demonstrates how many pennies a Madagascar Hissing Roach can pull. The presentation was part of the first Science Saturdays at Sam, as part of Beverly Irby's National Science Foundation grant for her project MSSELL. Approximately 200 fifth graders from the Aldine school district’s Stehlik Intermediate and Marcella Intermediate schools got lessons from Sam Houston State University faculty members in chemistry, earth science, biology and astronomy during the first Science Saturdays at Sam on Nov. 14. 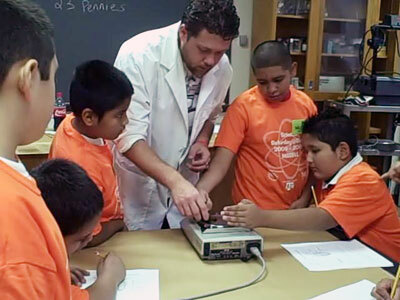 The day, part of a National Science Foundation grant, is designed to introduce non-native English-speaking students to the college setting while applying science in a fun way, according to Beverly Irby, College of Education associate dean for graduate programs and principal investigator for the grant. Project MSSELL, the research project, studies the effects of curriculum enhancements on the fifth grade students to determine the most effective way of teaching English-language learners the academic language of science. Science Saturdays at Sam is part of the curriculum enhancement. During the event, science faculty members and graduate students demonstrated four areas of science with presentations on chemical reactions, through tie dying; stars, via a visit and presentation at the planetarium; a discovery venture with rocks; and a math and science integration lesson using Madagascar Hissing Cockroaches. Participants also dined with Sammy Bearkat and were sworn in as Junior Bearkats. The project also works to enhance college recruitment at an early age. “When asked with Sammy Bearkat who would be coming to Sam, they all raised their hands enthusiastically,” Irby said. “They were excited about being on a college campus, especially SHSU. Faculty participants included Brian Cooper, Joan Hudson, Renee James, Tom Chasteen and Sibyl Bucheli. Volunteers also included the Orange Keys, the International Hispanic Association and a teacher education program student representative. Marla Slaughter, graduate assistant for MSSELL, coordinated the event. Because Project MSSELL is a longitudinal study, the same students will have the opportunity to visit campus in the spring and again in their sixth grade year in the fall and spring. The next Science Saturday at Sam is scheduled for February.